As 19th and early 20th century botanists and naturalists began exploring the southwestern U.S., one of the plants frequently described in their diaries and official reports was the extraordinary ocotillo, Fouquieria splendens. Illustrations accompanying these documents ranged from sketches of its unusual sprawling habit to detailed scientific renderings of its floral and vegetative structures. 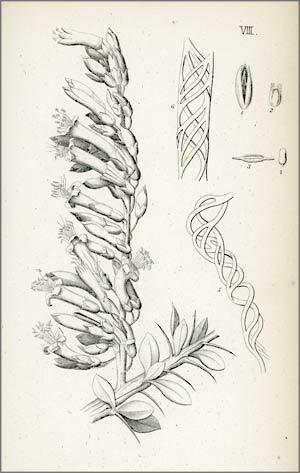 One remarkable illustration of the ocotillo was prepared from a California specimen for John Torrey’s botanical report of plants encountered during Lieut. Col. W. H. Emory’s 1846 military reconnaissance from New Mexico to California. The drawing includes the top of a stem with its panicle of flowers and enlarged views of the seed. What makes this illustration so unique is Torrey’s inclusion of greatly magnified views of the spiral vessels that compose the fine hairs on the margin of the seed. Torrey makes note in his report of how beautiful these structures appeared under the microscope, and they dominate the illustration with their unusual form. A later and more dramatic illustration by Mary Vaux Walcott (1860–1940) was painted from a specimen obtained in Superior, Arizona. 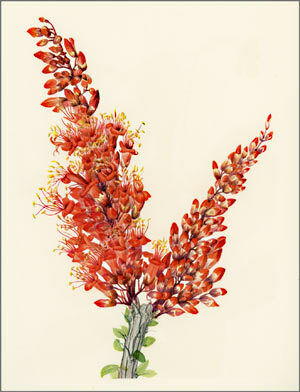 Walcott’s flamboyant watercolor of the ocotillo dispenses with enlarged details and portrays only the plant’s glorious flowers. This painting was one of 400 included in Walcott’s 5-volume North American Wildflowers (1925); following its publication Walcott was often referred to as the “Audubon of botany”. In addition to her renown as a botanical artist, Walcott was an accomplished photographer, and, with her brothers, spent many years photographing, surveying, mapping, and measuring glacial movements in Alberta and British Columbia. Mount Mary Vaux in Jasper National Park was named in her honor in 1908. This appeared in the May 2014 issue of The Desert Breeze, the monthly newsletter of the Tucson Cactus and Succulent Society.